The music that entertained George I during his trip down the River Thames from Whitehall to Chelsea on July 17, 1717, has become the stuff of legends, none of them more dubious than the tradition dating from the 1950s that Handel’s various pieces can be divided into three separate suites. 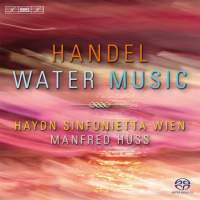 In fact, the scholarly suspicion that Handel envisaged the Water Music as one long sequence of movements was proved right when the earliest known manuscript score (dating from 1718) was rediscovered in 2004. The new critical edition of the score (2007) receives a meticulous representation conducted by Manfred Huss, who presents an argument that the ‘original’ version is ‘both varied and unified, with a “proper” beginning and effective conclusion…Moreover, the authentic order of movements creates a clear harmonic disposition’. The Haydn Sinfonietta Wien, led expertly by Simon Standage, play crisply and neatly: amiable horns and oboes chuckle in all the right places, the oboeand-bassoon trios are moderately playful, and the trumpets and horns are splendid in the Hornpipe (in which timpanist Alexander Grün intelligently improvises a suitable part). The lean strings shape the music tastefully, albeit with occasionally uneven intonation; the ensemble between violins and flute in the Menuet is patchy (the combination succeeds better in the livelier Rigaudons). The Lentement becomes bombastic and the cluster of Minuets (sometimes nicknamed the ‘Country Dance’) might have benefited from more tenderness or humour as each section insinuates, but the spectacular overture from the Occasional Oratorio (1746) provides a magnificent encore.